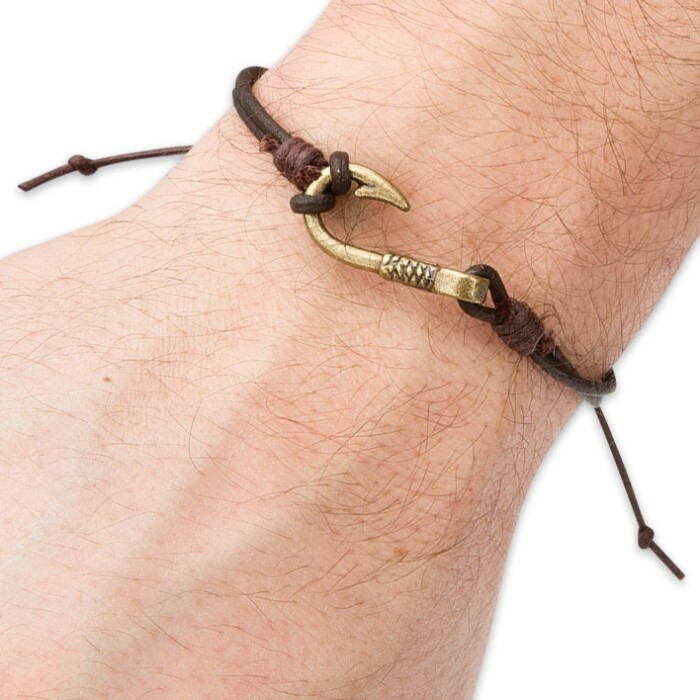 Antique Brass Fishhook and Leather Cord Adjustable Bracelet | BUDK.com - Knives & Swords At The Lowest Prices! The rustic, artisan style of this Antique Brass Fishhook Bracelet is perfect for those who prefer life at a calmer, slower pace - those who feel more at home in a country farmhouse than a metropolitan high rise and who’d rather ride the open range than cruise bustling city avenues. 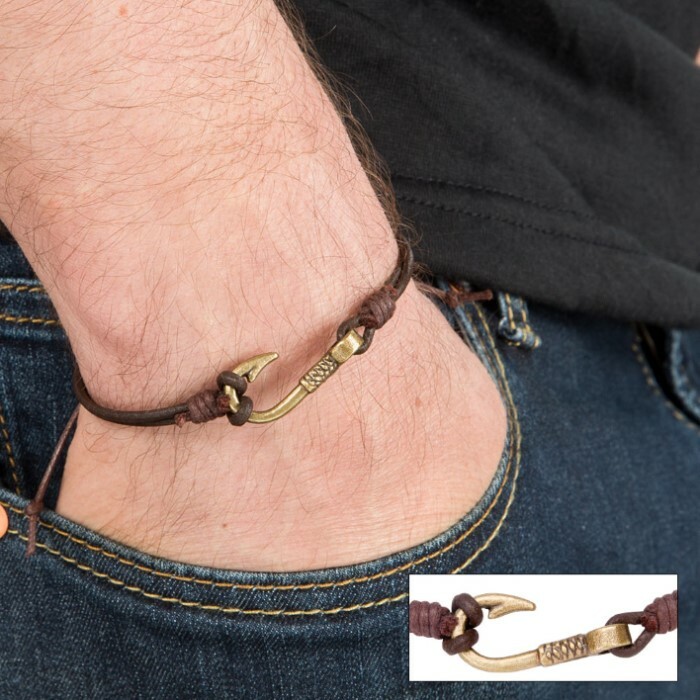 Beautiful in its simplicity, this bracelet trades gaudy, glittering jewels and eccentric high fashion design for a single antique brass-colored fishhook tied carefully to “downhome-dapper” genuine leather cord. With no delicate strands, links or insets to break or expensive gemstones to lose, it’s an ideal accessory for farmers, mechanics, carpenters and other hard-working folks who do vigorous jobs with their hands, often outdoors. It’s also great for swimming, showering and, naturally, fishing - any conditions where ordinary jewelry wouldn’t stand a chance. The 1" long antique brass fishhook features fine details like an authentic-looking barb and cast filament line wrapped around the shaft. It pairs perfectly with the rugged leather cord, fully adjustable from approximately 6” to 11” in circumference. This cool bracelet fits almost anyone, and the sturdy pull-string adjuster makes it easy to take on and off. 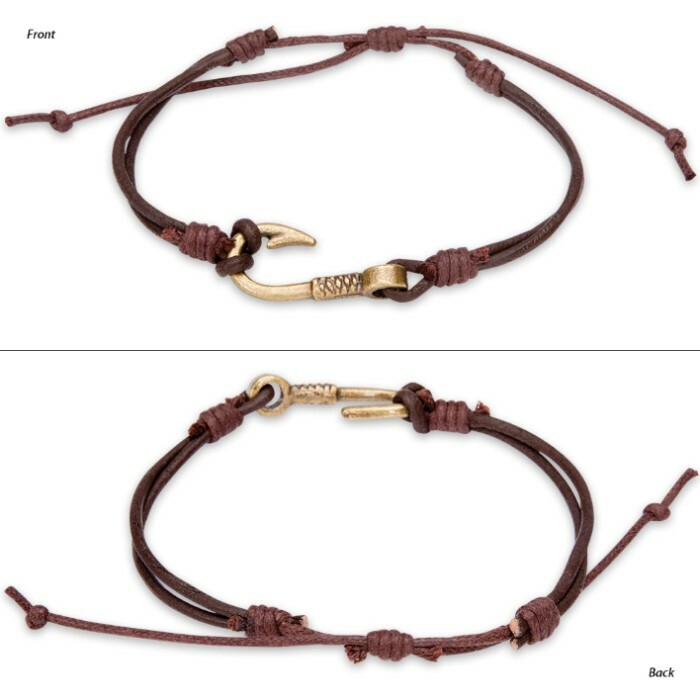 The Antique Brass Fishhook Bracelet makes a fantastic gift for anyone - especially anglers, outdoorsmen, plain ‘ol country folk and even city dwellers who want to add a bit of rural charm to their personal style. You won’t find better prices on fine rustic jewelry like this anywhere else, so go ahead and get two - one to gift and one for yourself! It’s easy and won’t break the bank. But hurry! Don't let this be the fish that got away!